The Cardiff Retail Gate Retail, one of the most prestigious furnishing mall located within the residential district of Pontprennau, in the heart of Cardiff Gate business park, is the location chosen by Natuzzi to inaugurate the brand new Editions store. The space – functional and welcoming – has a width of 630 square meters and exhibits through 30 roomsets the best products of the Natuzzi Editions collection. The Editions retail development plan further strengthens its presence in the UK with a second store, this time in the city of Glasgow, Scotland. More than 300 square meters of exhibition inside the Abbotsinch Retail Park, the largest shopping park in the metropolitan area of Glasgow, the ideal destination for a shopping dedicated to furnishing. The store is divided into 16 roomsets and 3 areas dedicated to dining with dining tables, chairs and sideboards, launched inside the collection for the first time. 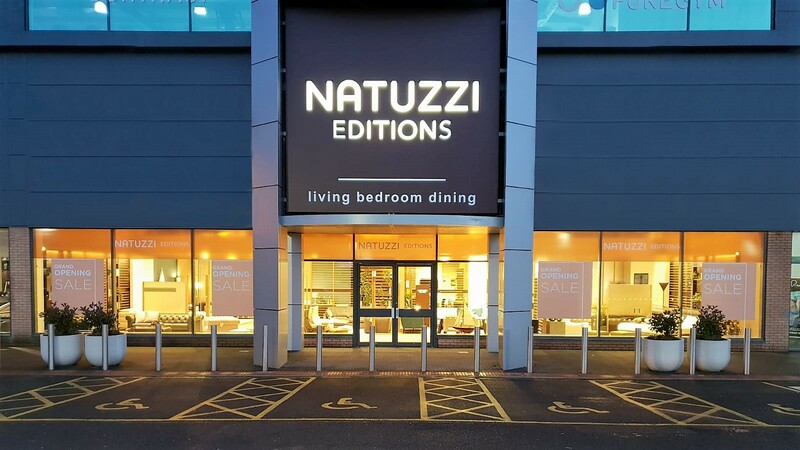 These two openings consolidate the Natuzzi Editions expansion for the European market.